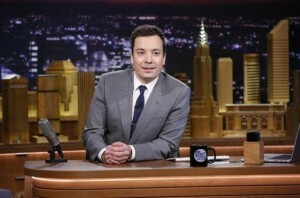 Late night television has taken over pop culture news this week, as Jimmy Fallon is in his first week of hosting The Tonight Show, and Seth Meyers prepares to take over Late Night. My most vivid memory of late night tv doesn’t have anything to do with my favorite host or guest. What I remember most is begging my dad to let me stay up and watch with him. I was young enough at the time that Johnny Carson was still the host of The Tonight Show, but that didn’t necessarily matter to me. It felt like a treat to stay up way past my normal bedtime and watch what seemed like a terribly grown-up show. Sometimes my dad would give in and let me watch without a fight. Sometimes I would creep back downstairs and sneak in to watch anyway, my dad looking at me over top of his glasses with a serious “didn’t I just tuck you in” look. But he would never get mad at me for it, he never got mad during The Tonight Show. Sometimes I would pretend to fall asleep on the couch and watch the whole show with one eye open. Those nights The Tonight Show felt like my own private secret. But more often than not, I would actually fall asleep, lulled by the haze of music and applause from the tv. This nostalgia factor, the strong memory of watching a grown-up show for the first time as a child, is a driving force of late night television. And Jimmy Fallon seems to have an innate understanding of this. He didn’t use his first monologue to tell the most clever jokes he could think of. Instead, he came out and introduced himself to viewers, and told similar stories about staying up late with his own parents to watch The Tonight Show. It wasn’t the edgiest example of television, but it didn’t need to be. Fallon was showing that he gets it, he’s one of us. 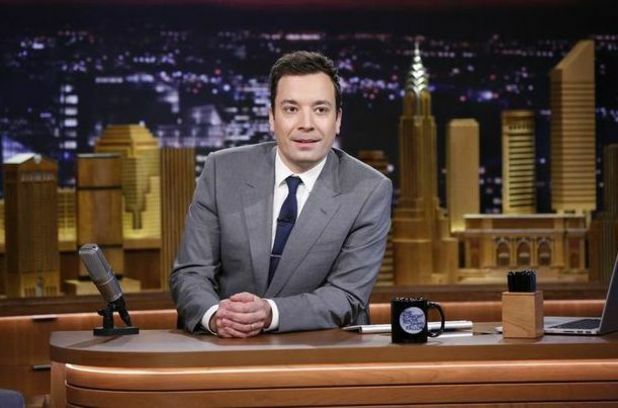 The Tonight Show moving back to New York City is significant not just for media reasons, and Fallon’s new set shows why. Every night, Fallon sits in front of a backdrop of a retro New York cityscape, the Chrysler building immediately identifiable with its iconic silver top. That’s what this version of The Tonight Show is: both a retro city that exists in dreams and memories, and the city as it is now made tangible. And sitting in front of it all is an affable guy offering a smile and laughter to help us navigate along. If I were still a kid, I’d be excited to curl up on the couch next to my dad and watch this version of The Tonight Show as a treat. As a grown-up, I’m glad that I set my own bedtime now. Well said. I still remember those precious few nights when I got to stay up late for Johnny Carson too. I know there are many for whom Leno held the same appeal, but he never really resonated with me. Fallon seems much more in that classic, Carson cast, and I’m so looking forward to him having a long run. Totally agree about Leno. By the time he took over, staying up late to watch with my dad had lost its novelty, so I never had any nostalgic attachment to him, and he didn’t resonate with me in any other way. Fallon’s first week has been so enjoyable. He’s great at bringing out the fun side of people, no matter who his guest is. I’m excited now to see how Seth’s show goes next week!